As soon as you make a flight reservations, most airlines allow you to select a seat assignment. 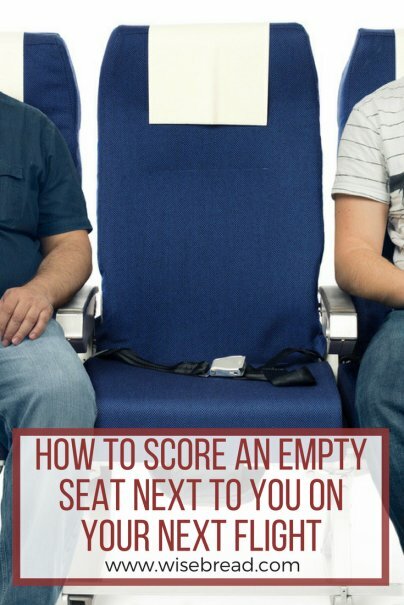 And in general, most passengers choose seats in the front of the plane in an aisle or a window seat, not a middle. This means that the last seats to be chosen are the middle seats in the back of the plane. Another strategy involves the extra-legroom seats that most airlines offer. These are in sections sometimes called economy plus, comfort plus, or main cabin extra. Seats in these areas are available to flyers who hold elite status in the airline's frequent flyer program, or to anyone else who pays an extra fee. On domestic flights, these may fill up if there are a lot of business travelers, because many of those road warriors have elite status. But on international flights, these seats are often the last to be filled because many leisure travelers are unwilling to pay the extra fees. Therefore, the rows at the back of this premium section may be even more likely to have an extra empty seat than the rows of standard seats at the very back. If you hold elite status or choose to pay for the extra legroom, then this is where you will want to sit to have the most chance of an empty middle seat. If the tips above fail and you're assigned a seat you don't want, check the airline app when you're at the gate. You may be lucky enough to spot a seat that's available next to an empty seat and if so, some apps will let you change your seat right then and there. If not, try asking the gate agent to make the swap. It won't always work, but it never hurts to check. Southwest Airlines doesn't offer seat assignments, so you have to use a slightly different strategy to find an empty middle seat to sit next to. As with other airlines, Southwest passengers prefer to occupy the seats in the front of the plane, as well as the aisle and window seats. However, I've observed that some Southwest passengers will walk all the way to the back of the plane to look for an empty aisle or window seat, rather than take empty middle seats near the front of the plane. Beyond that, some Southwest passengers have resorted to questionable behavior to save an empty seat next to them, such as placing an item on it or making themselves seem as unappealing as possible as seatmates. This can include spreading themselves out, pretending to be sick, or simply engaging in a loud telephone conversation while boarding. I don't recommend any of those tactics. You'll likely have to sit in close quarters with these folks and you don't want to be making enemies before the flight has even started. Anyway, these behaviors will make no difference if the flight is completely sold out.